proDAD special discount - HURRY UP !! Hurry up, hurry up, proDAD is offering a very special discount of 25% until the end of april. Take 25% off all regularly priced products in the proDAD online shop here only. There is no limits on how much you can buy ! 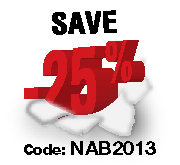 Use coupon code NAB2013 on this page at checkout to receive the discount. UPDATE 28 April 2013: enjoy a 25% discount, learn how by reading our article. UPDATE 28 April 2013: enjoy a 25% discount, learn more by reading our article. An if you don't owb Boris Graffiti yet, it might be a good opportunity to get it with a discount or to consult our Boris Tutorials ?